The Breac Maedoc and the Bell of St. Mogue are associated with St. Mogue (Maedoc or Aidan), who was born in the 6th century on the small island of Inis Breachmhaigh (now Mogue’s Island) at Bawnboy, Co. Cavan. St. Mogue spent his youth in Cavan and became known for performing miracles to protect and aid local people. He left Ireland and studied under St. David in Wales for many years, before returning to Ireland and founding his own monastery at Ferns in Co.Wexford around 570 A.D. Although he is commonly referred to as the Bishop of Ferns, St. Mogue still has a close association with his native Cavan. The Breac Maedoc (St. Mogue’s Shrine) is of enormous cultural importance to Cavan. 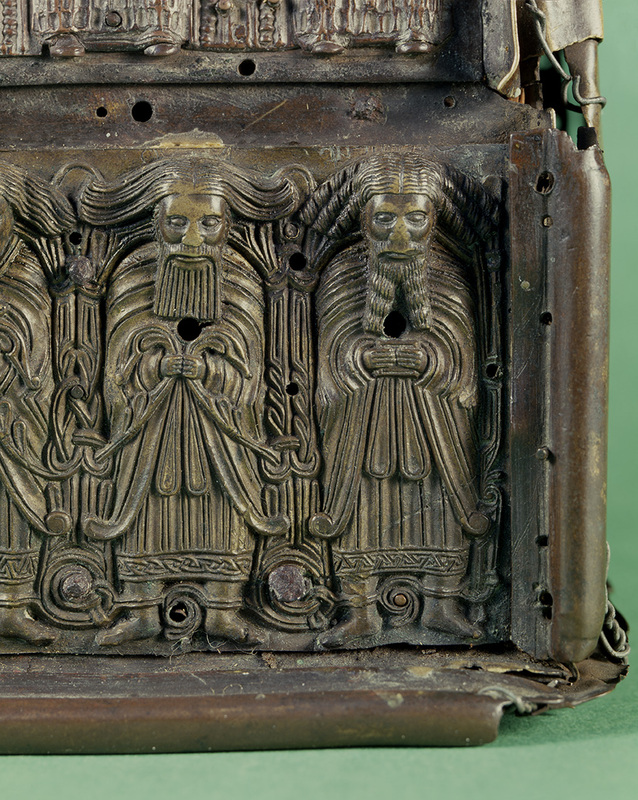 It dates from the 9th century, and is a fine example of an early medieval reliquary, which were normally used to house the relics of important saints. The shrine is one of the earliest of its kind in Ireland and is constructed in the shape of an ancient cill or church. The sides of the shrine were later decorated with ornamental designs and embossed figures in 8th century costume, and the workmanship is of a very high quality for its period (11th century). During the middle ages the shrine was kept at Drumlane abbey in Cavan, on the site of the original monastery associated with St. Mogue in his youth. It was highly prized as a religious object with miraculous powers, and would have attracted many pilgrims to the site. Following the dissolution of the monasteries by Henry VIII the shrine fell into the possession of the Mac Graghan family and eventually into the hands of the local clergy in the parish of Drumlane. In later years it was often borrowed for use as a sacred object upon which to swear a binding oath. The great antiquarian Dr. George Petrie purchased the object in the mid-19th century and upon his death it was acquired by the Royal Irish Academy, who in turn gave it to the National Museum of Ireland in the 1890s. Legend says that the Bell of St. Mogue was given to the infant saint on his birth by St. Killian, who baptised him. The bell remained on Mogue’s Island in Cavan for centuries under the guardianship of local families until it was eventually housed in the Armagh Public Library. The casing for the bell is believed to be 10th/11th century in origin. Museum opening times: Tuesday – Saturday 10 a.m. – 5 p.m. – special opening on Sunday 17th October from 2 p.m. – 6 p.m. to give people every opportunity to see this unique historical artefact. There will be a lecture by Dr. Brendan Scott on the history of ‘The Breac Maedoc’ on Thursday 21st October at 8 p.m. in Cavan County Museum. Everyone welcome.